Jules Bastien-Lepage (1848–1884), London Bootblack (1882), oil on canvas, 132.5 x 89.5 cm, Musée d'Orsay, Paris. The Athenaeum. The first of these two articles looked at the paintings made by Jules Bastien-Lepage (1848–1884) leading to his ‘high Naturalism’. 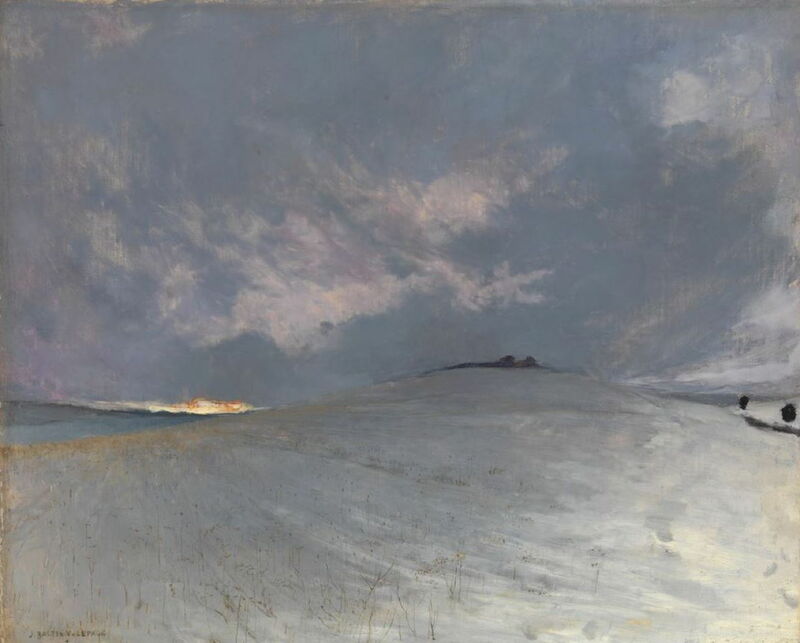 This article moves on to consider the remarkable series of paintings that he made in 1882, before his declining health took its toll on his output. Jules Bastien-Lepage (1848–1884), Snow Effect, Damvillers (c 1882), oil on canvas, 45.1 x 55.3 cm, Fine Arts Museums of San Francisco, San Francisco, CA. The Athenaeum. Not all his paintings were typically Naturalist. He continued to make some fine landscapes, of which Snow Effect, Damvillers from about 1882, is arguably his finest, and most Impressionist. The relationship between Impressionism and Naturalism is an interesting and controversial issue; Claude Monet was particularly influenced by Bastien-Lepage’s Naturalism, although there was very little overlap between their work. Of the core Impressionists, it was probably Pissarro whose paintings came closest to Naturalism. Jules Bastien-Lepage (1848–1884), Evening at Damvillers (1882), oil on canvas, 66.4 x 80.3 cm, Philadelphia Museum of Art, Philadelphia, PA. The Athenaeum. 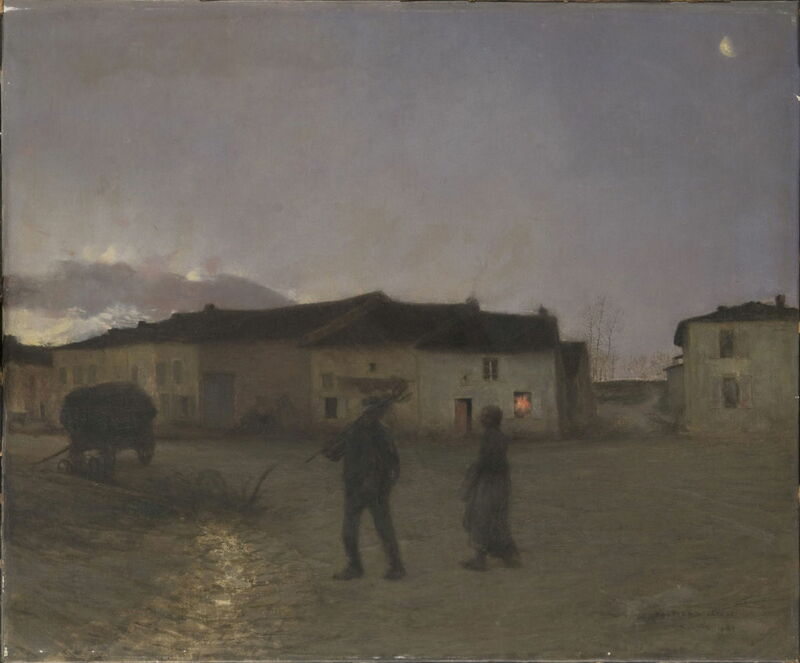 The figures caught in the late dusk of Bastien-Lepage’s Evening at Damvillers (1882) are a reminder that people were still at the centre of his art, though. 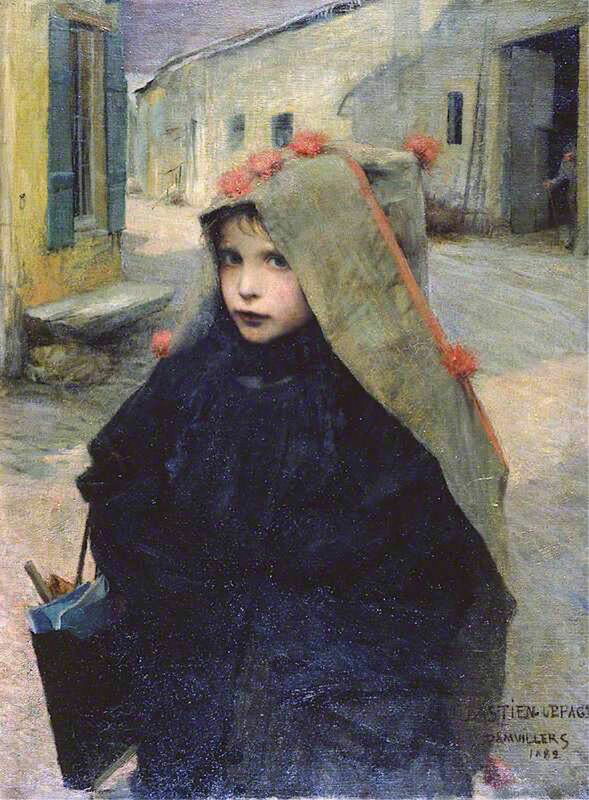 Bastien-Lepage pushed his formula to the limit in this enchanting painting of Roadside Flowers or The Little Shepherdess (1882). The sky has been reduced to a thin sliver, and almost the entire canvas is devoted to its detailed foreground. 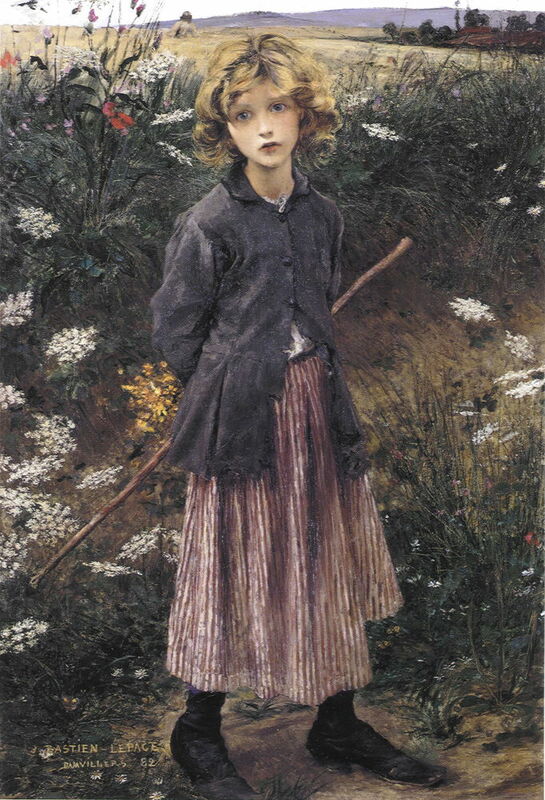 Like the weeds behind her, this little girl has a wide-eyed and slightly sad beauty. Although her clothing is visibly tatty, her face and hair are idealistically clean, in keeping with a romantic sentimentalism rather than the objectivity which is characteristic of true Naturalism. Jules Bastien-Lepage (1848–1884), Going to School (1882), oil on canvas, 80.9 x 59.8 cm, Aberdeen Art Gallery and Museums, Aberdeen, Scotland. The Athenaeum. Going to School (1882) takes us into the village, but again this girl is a little too clean and perfect to be objective. 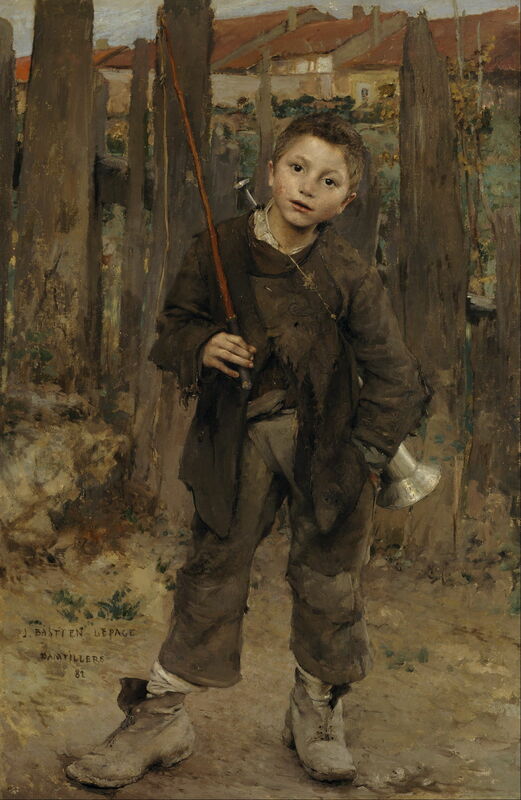 Pas Mèche (Nothing Doing) (1882) is nearer the mark: a cheeky ploughboy equipped with his whip and horn, on his way out to work in the fields. His face is grubby, his clothing frayed, patched, and dirty, and his boots caked in mud and laceless. 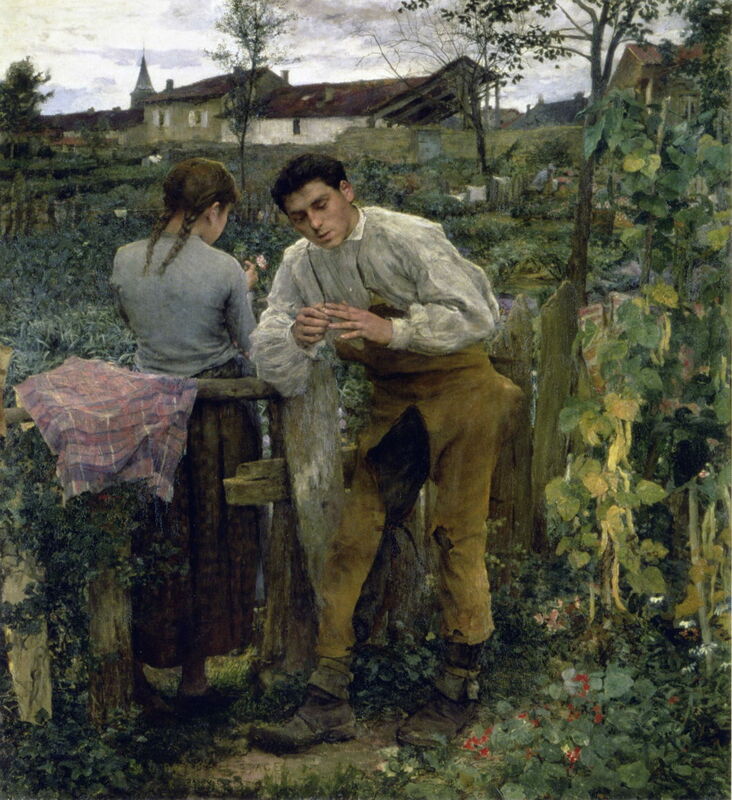 Many of Bastien-Lepage’s paintings from 1882 were single-figure portraits, mostly of children, but in Love in the Village he shows a young couple on either side of a tumbledown fence, chatting intimately among the vegetable patches. Jules Bastien-Lepage (1848–1884), The Thames, London (1882), oil on canvas, 54 x 74.3 cm, Philadelphia Museum of Art, Philadelphia, PA. The Athenaeum. 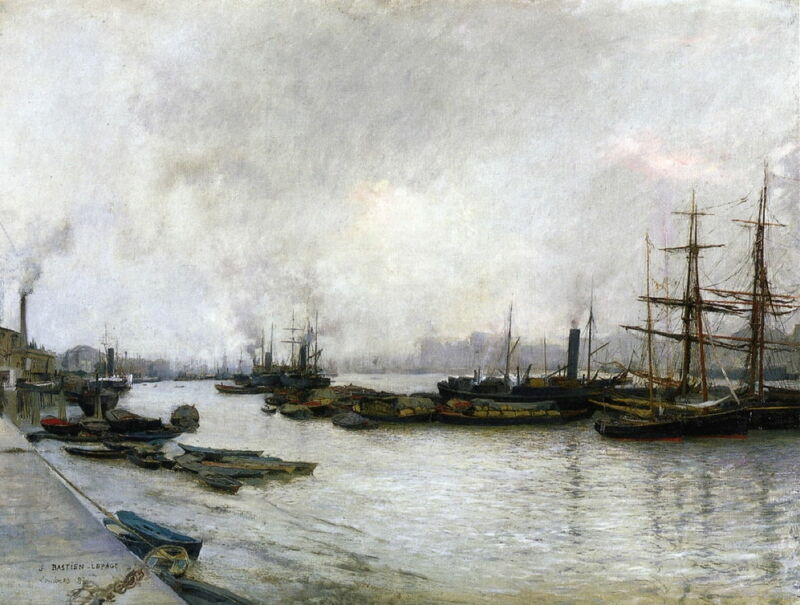 Bastien-Lepage visited London, where he again painted the river in The Thames, London (1882). This maintains fine detail right into the far distance, except where it is affected by the smoky and hazy atmosphere, and its horizon is kept well below the middle of the canvas. 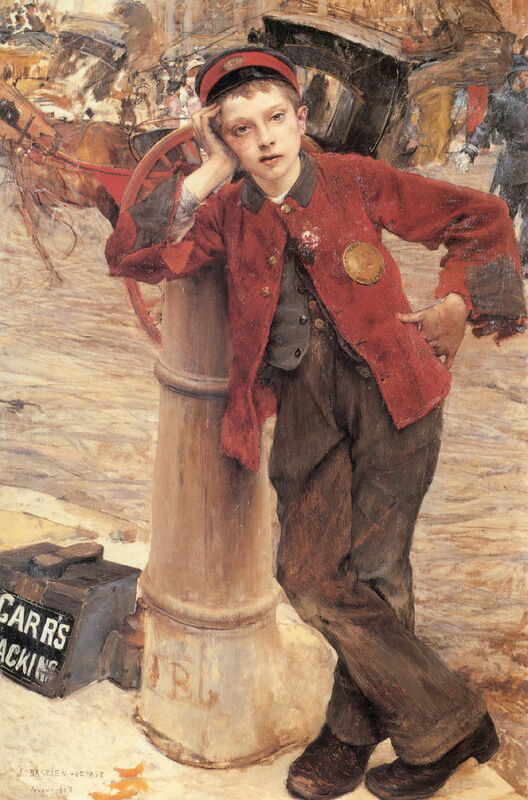 Jules Bastien-Lepage (1848–1884), London Bootblack (1882), oil on canvas, 132.5 x 89.5 cm, Musée d’Orsay, Paris. The Athenaeum. In London, he painted one of his most characteristically Naturalistic works, showing a young boy working on the street as a London Bootblack (1882). This could have been taken straight from the journalistic accounts of London’s streetlife by Henry Mayhew, or their fictional reworking in the novels of Charles Dickens. The documentary realism of the foreground gives way to a more sketchy and jumbled background. Jules Bastien-Lepage (1848–1884), Flower Market in London (1882), oil on canvas, 173.4 x 90.2 cm, Private collection. The Athenaeum. 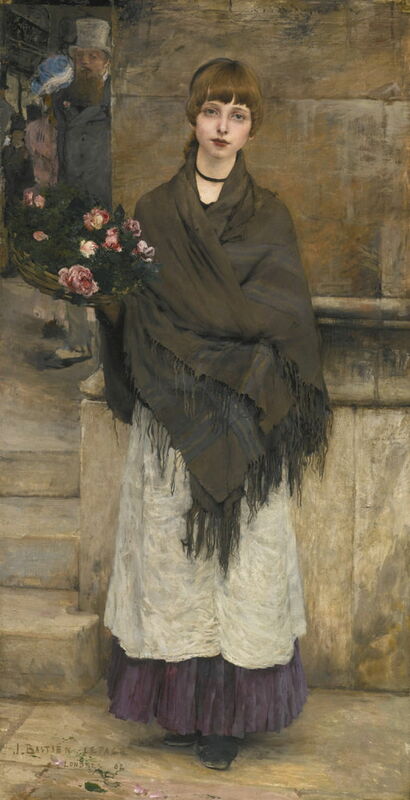 Bastien-Lepage’s portrait of a flower seller in a Flower Market in London (1882) is The Little Shepherdess of the city, posed against dull brown stonework. In the background is a reminder of how the other half lived, as an affluent man in a pale top hat walks alongside a woman wearing an exuberant blue hat. Jules Bastien-Lepage (1848–1884), The Blind Beggar (date not known), oil on canvas, dimensions not known, Musée des Beaux-Arts Tournai, Tournai, Belgium. Wikimedia Commons. I have been unable to read the date on this portrait of The Blind Beggar, painted in Damvillers again, but guess that it was most probably painted between 1880 and 1883. 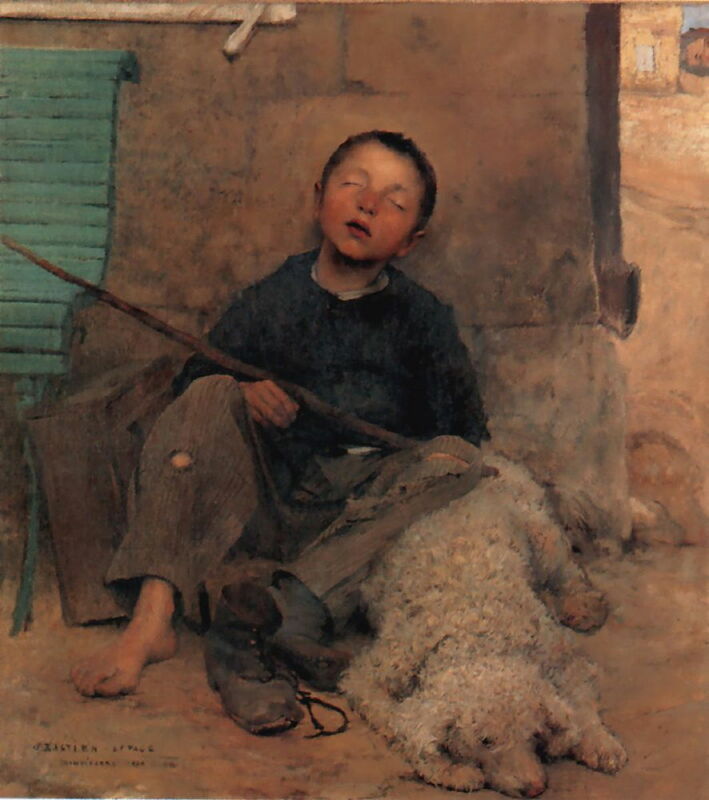 Bastien-Lepage continued to paint during his final illness in 1883-84, although his output appears to have fallen dramatically. I suspect that most of his surviving works from those years are in private collections, and seldom pass into public view. Dated in 1883, The Little Chimneysweep (Damvillers) is unusual as its subject isn’t shown standing, face-on to the viewer, but he sits and looks down at the kitten at the lower right. This young boy is also the dirtiest of Bastien-Lepage’s waifs, his left hand still being black with soot from his work. He appears to be living in a hovel, with the embers of a fire at the left edge. 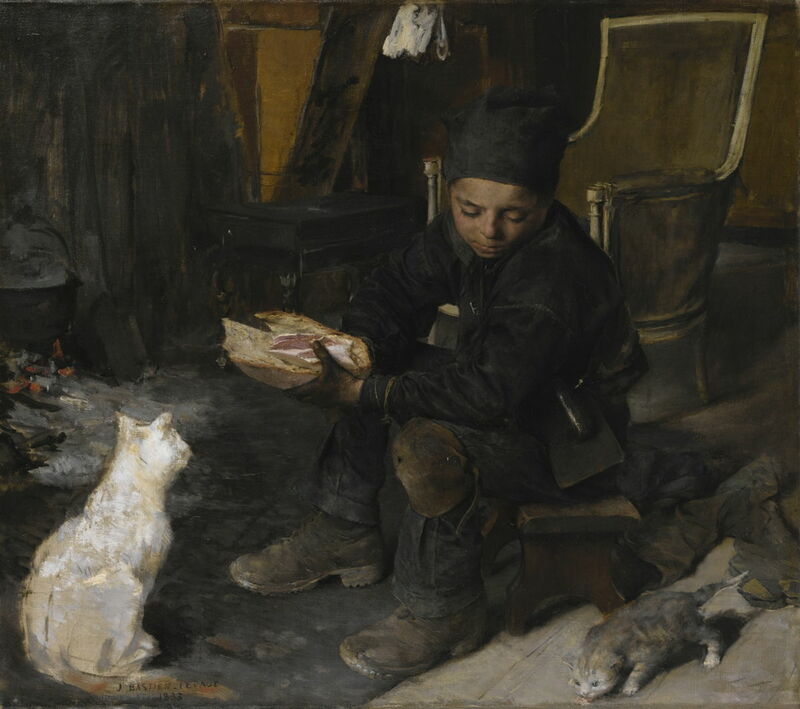 Although signed, and presumably complete, the prominent white cat in the foreground remains very sketchy, and contrasts with the careful detail of the boy and his large bread roll. Bastien-Lepage seems to have been moving on to a looser style, perhaps, when he died the following year. After his death at the end of 1884, the influence of these paintings lasted well into the 1890s. His work couldn’t define Naturalism, but it had certainly come to dominate it, both in France and elsewhere. Posted in General, Life, Painting and tagged Bastien-Lepage, Dickens, Mayhew, Monet, naturalism, objectivity, painting, Pissarro, realism. Bookmark the permalink.